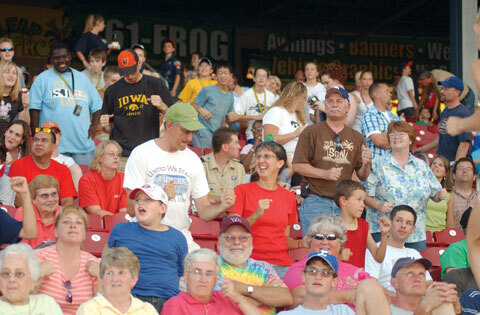 The Cedar Rapids Kernels Party Package is perfect for bachelor/bachelorette parties, adult birthday parties, or any small group of 10 or more. The package includes a club ticket (box seat) to the game and a food and drink package. The food and drink package includes a sandwich (hamburger, hot dog, brat or cheeseburger), bag of chips or small popcorn, and two beverages - choose from a 20 oz. bottle of soda, a 20 oz. bottle of water, or a 16 oz. draft beer. The package is $18 per person, and a minimum purchase of 10 tickets is required to book. For more information or to book your Kernels Party Package, contact Peter Keleher at (319) 896-7622 (email: peter@kernels.com).